Pork recipes are an easy dinner idea that are quite versatile. Pork can be combined with fruit, barbeque sauce, spices and practically any ingredient you wish. Like the other easy and free recipes provided on this site, the final pork recipe is delicious and incredibly tasty. 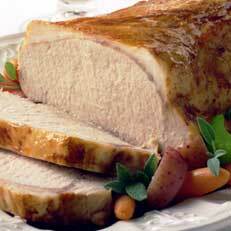 The recipes provided suggest using lean cuts of pork such as boneless loin roast and boneless ham. For more information on pork and its nutritional value please click here. Once on the site, if you click on "All About" there will be all the information you need to know about pork. Pork is nice to cook with because it doesn't require a lot of preparation time. By using lean cuts, it minimizes the time spent trimming off fat. Pork can be left to cook in the crock pot all day long like the other types of meat. Just place it in the crock pot before work and by the time you get home, there will be a fabulous dinner waiting.